I have a sister who lives in Georgia and she saw this concert a couple of weeks before our April 3rd concert. She told how awesome the show was and was emphatic that I could not miss it. As the concert date approached, I realized that I might not be able to make it to the P!nk concert because I was set to attend a wedding in San Diego, California that weekend with the festivities beginning on Thursday, April, 4. I thought I’d have to send someone to cover the show for me. Well, when it was confirmed that Utah Concert Review was given media access, I debated on if I should just go to the show, or have one of the many talented writers cover it. I heeded my sister’s advice and decided I would attend the show myself. I just couldn’t allow myself to miss it. The reason I tell you this story is to give you an idea of just how truly incredible this concert was. I left Vivint Arena, jumped in my car and began the 10-hour drive to San Diego. I was able to drive through the night without getting tired once because of the energy and adrenaline I received from watching P!nk in concert. I’m not sure how many people in the crowd had seen the May 2018 concert, but from what I can gather it was the same setlist and more or less a similar show as far as choreography and sets go. But that’s the amazing thing about live music. The setlist can be the same as the night before, the dancers can perform the same moves night in and night out, and P!nk can even have the same things prepared to say. But no show is ever exactly the same. The lights went out and the huge pink curtain was drawn to reveal P!nk high in the air swinging from a chandelier. Has a more appropriate song been written for beginning a concert than “Get The Party Started”? It’s a perfect fit. The audience rose to their feet and the party really did begin. There were couples, large groups of women and entire families dancing and singing along to this major hit. I brought my buddy Matt along for the show and you can bet that we were just a couple of guys rocking out to P!nk right along with the rest of the throng. P!nk is one of those artists where you think you know her songs and then as the show goes along you realize, ‘Wow, she has so many hit songs’. They came one after another. Songs like “Just Like a Pill” or “Who Knew”. These are songs that any artist would love to have as their biggest hits and they were some of the first songs performed in the concert. There were still so many hit songs to come. Despite having hit after hit of her own, P!nk spent some time paying tribute to some artists she enjoys. She did a mashup of “Funhouse” and No Doubt’s “Just a Girl”. The mashup songs went really well together and P!nk could do a No Doubt tribute album and I’d for sure buy it. P!nk followed with a surprisingly well-covered version of Nirvana’s “Smells Like Teen Spirit”. Not that I didn’t think she had the chops to do it. I guess I feel like “Smells Like Teen Spirit” is one of those songs you just don’t touch. But as I said, I was pleasantly surprised. She pulled it off. Shame on me for doubting P!nk. I’m starting to believe P!nk can do anything. 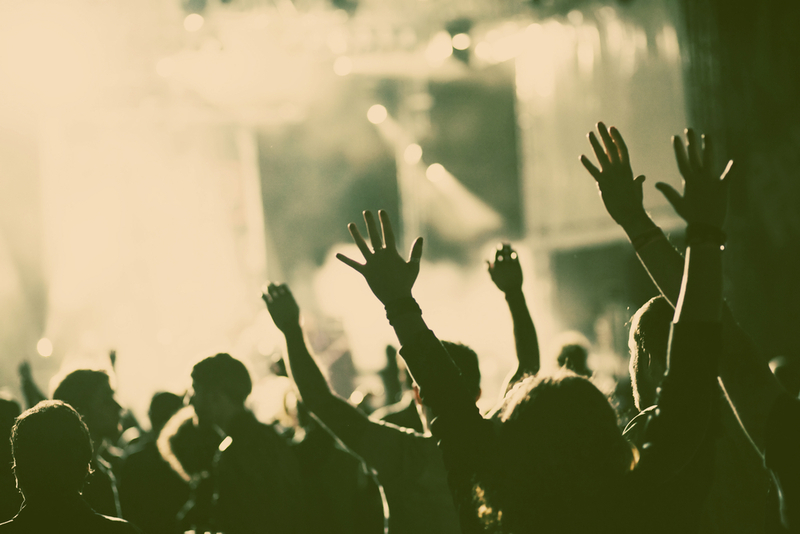 I think the reason we go to concerts is to feel something. We want to have an emotional experience with an artist and their songs. P!nk is high on the list of artists who tap into a wide array of emotion. It’s impossible to leave her show without having felt some sort of emotion. I found it amazing that within this show I felt the uneasiness of vulnerability, the inspiration to feel like I can do anything, the angst of lost love and feeling like no matter what I’m still good. I’ve felt those things in other songs at other concerts, but not quite like this. It felt as if everyone in the arena was going through these emotions at that exact moment together. That’s all P!nk. It’s the way she connects to her audience. P!nk has gone above and beyond to reach her audience. I mean that literally. If you bought a seat in the upper bowl, you were able to see P!nk up close many times. I mentioned the opening chandelier, well she followed that with a bed that lifted into the air giving the upper bowl a closer look and those on the floor perspective on just how high up she was. She spun on silks, and ropes while still singing perfectly. She did one song with a male dancer where they were both lifted simply by silks. At the end of the song P!nk freed herself from her silk relying solely on the man’s grip. At one point he had her feet pinned between his legs as they spun. As I’m watching this I start looking around at the crowd to see their reaction. People were amazed, freaked out and in total awe that a major artist would take such risks. I’ve never seen anything like it. The thing I was most impressed with was how P!nk could transition from something as grandiose a Cirque Du Soleil style routine to something so stripped down like a show at the Blue Bird Cafe’ in Nashville. 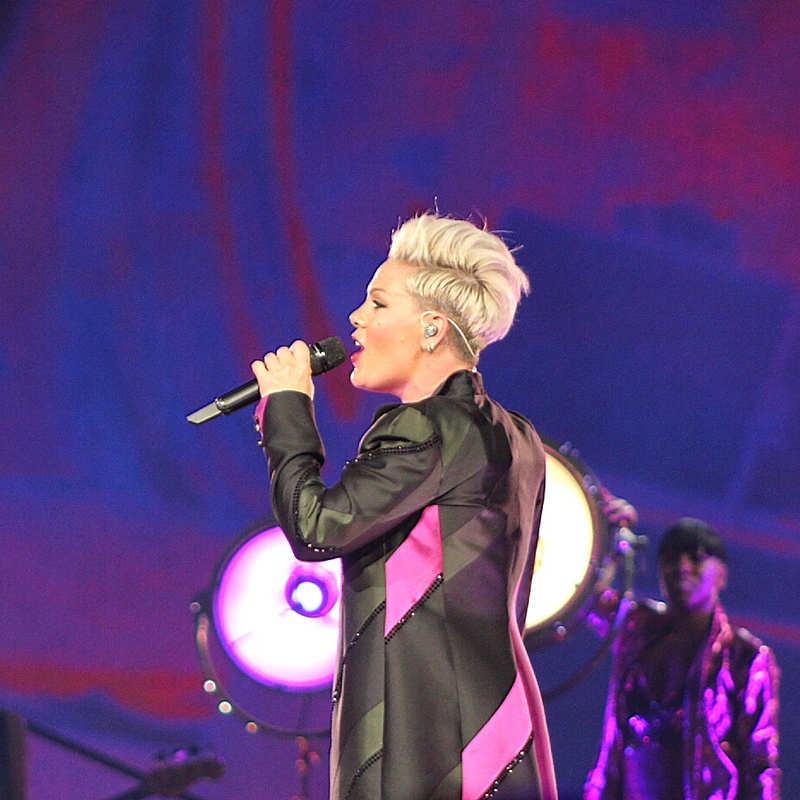 There was a point in the concert where P!nk brought her band to the end of the heart-shaped catwalk and performed stripped down versions of her songs. My favorite from this set was “I Am Here”. I think it would be cool to see P!nk perform a small show in a club. Her shows are so huge and full of eye candy. Which is amazing. But I think she would do just as spectacular of a show with just her band in a place the size of Velour down in Provo. P!nk finished an amazing main set with two of her biggest songs “Raise Your Glass” and “Blow Me (One Last Kiss)”. I didn’t think the crowd could be more alive, but the arena blew up during these two songs. Confetti flew through the air and P!nk left the stage. I’m sure the crowd knew she was coming back but they cheered loud enough to ensure it. P!nk walked back on stage and said, “We’re going to do this one like we used to do it!” The song “So What” began and P!nk made her way down the stage stairs and into the crowd. From what I’ve been told, and from what I’ve seen in YouTube videos this is the song where P!nk straps into a mechanism that flies her to just about every point of the arena, high, low, and far out. But on this night, P!nk made her way through the floor of the arena, making various stops to sing verses and encouraging the crowd to sing along. Now unless you knew that this is when P!nk normally soared through the air, you couldn’t help but be excited to see P!nk that close to the audience. And I have to admit I was pretty excited when P!nk stopped five feet in front of me to sing the second verse. So while I knew that there must have been some kind of technical issue, I reaped the benefit by having her so close to me. I would have to think this is the first time she’s sung this song from the ground in years. As I said, no show is ever the same. The audience was going ballistic. People were dancing like they were in their room alone. I saw a group of women singing the words in each other’s faces. I saw kids smiling and waving to P!nk and hugging their parents when she returned a wave and a smile of her own. After “So What” P!nk walked off stage and the band continued to play. I told my friend Matt that I bet they were playing so P!nk could sneak out of the arena with her daughter before the majority of the crowd left the arena. This is a tactic used often by artists who are trying to get to the hotel or to a plane quickly. But I was so happy to be wrong. P!nk had one more song in her arsenal. P!nk returned to the stage in a white t-shirt and torn baggy jeans and performed “Glitter in the Air”. As high as “So What” was, this song was equally as powerful but in such a different way. Again, the transitions P!nk makes in her show are perfectly timed. Just when I thought she was done surprising me she closes the show with this beautiful performance. As dramatic as it sounds, “Glitter in the Air” was so perfectly performed that I saw tears from many of her fans in the audience. P!nk connects with her audience in a way that I’ve rarely seen. She gives her fans an outlet to feel whatever they’re feeling in their lives at that moment. If they’re feeling defiant, she has a song for that. If they’re feeling sorrow, good news, P!nk has a song for that. If your feeling inspired and ready to take on the world, P!nk has a catalog of songs for you. And if you’re feeling love, hope, confident and strong, P!nk’s concert will only punctuate those feelings.